Home 2018 April 9 Model Minority Myth: Helpful or Harmful? The “model minority” myth. What exactly is it? Is it something that someone made up in order to make himself/herself feel good? Or is it something that was made to harm others? Well, it can be both. From my prior knowledge, the “model minority” myth is a false statement that all Asian-Americans are very intelligent, hard-working, and successful. However, this is not always the case. There are always people who don’t fit into the stereotype that was shaped for their race or ethnicity, making them feel like they don’t belong or that they’re inferior to others just like them. As an Asian-American, there have been times in my life when people would stereotype me to be the “smart Asian girl who always gets A+’s”. I feel like because people have only focused on the stereotype, they forget that Asian-Americans are just as human as they are. Additionally, there are other Asian-Americans who don’t fit into this mold: they might not be as smart, hard-working, or successful as this stereotype calls them to be. Because of the pressure that society places on them, they feel the need to be part of the “model minority”; they feel the need to fit in. When I first started this project, my goal was to bring attention to this myth and show the harm in it. Through my research, I have seen that the general Asian-American and Pacific Islander (AAPIs) population is very intelligent, successful, and hard-working. As I dug deeper, I realized that different races have different experiences from others. Some races aren’t prospering as much as others, in fact, they are doing poorly in comparison. This just shows that not all AAPIs are capable of fitting in. Through this video, I want to show you that if you’re an AAPI, it’s okay to not fit into something that you weren’t made to fit into. 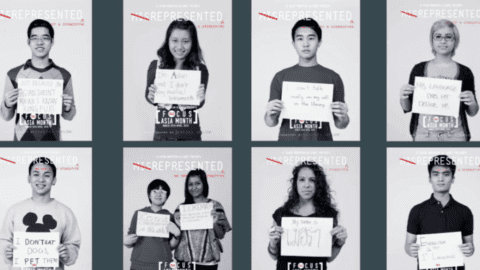 Model Minority Myth: Helpful or Harmful? by Sarah Joy is licensed under a Creative Commons Attribution-ShareAlike 4.0 International License.